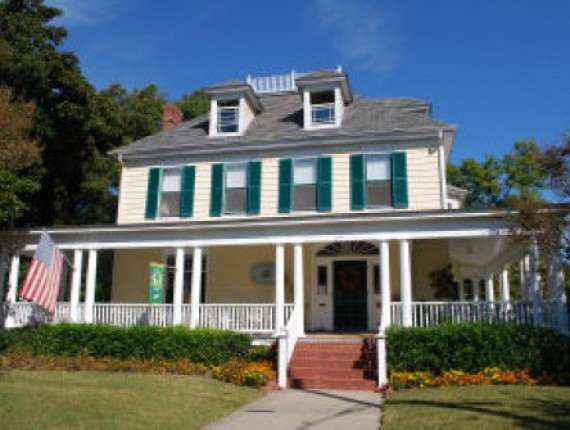 Cape Charles House Bed and Breakfast on Virginia’s Eastern Shore, invites you to escape to a slower pace and a step back in time. Visit the quaint town with Victorian and other turn-of-the-century architecture, nestled on the shores of the Chesapeake Bay, with quiet bay beach. To the north of the peninsula, near the Maryland state line, is Chincoteague, the home of the famous Chincoteague ponies. Just 38 miles across the bay lies the Norfolk-Virginia Beach area . Historic Williamsburg is only a little over one hour away. The concentration of historic homes has placed the seven block square town on the National Register of Historic Places. Relax at the tranquil beach that fronts the town, walk the jetty pier, take a sunset sail, pedal through town on guest bikes, delight in biking the back roads, go hiking on nature trails at the Eastern Shore Wildlife Refuge, enjoy bird watching around the bird banding station at Kiptopeke State Park, sip afternoon tea and later wine and cheese. Dine at restaurants where seafood is fresh and the conversation is lively. Special Golf Package available at Bay Creek Golf Club, Arnold Palmer and Jack Nicklaus Signature Courses, considered by Golf Magazine, one of the nations top 10 courses. Visit antique shops and galleries, play tennis, walk the beach and marvel at the east coast’s most beautiful sunsets. The Colonial Revival, 1912 bed and breakfast, is considered one of the largest, more opulent in town with wide wraparound front porch and a grand foyer with majestic Corinthian columns framing the grand staircase. The guest rooms have individual bathrooms, sitting areas, ceiling fans and climate control. Selected fabrics and furnishings breathe new life into the sunny, many windowed rooms. High ceilings, original moldings and doors help maintain the historic integrity. Each room portrays a personality of enormous charm, filled with antiques, oriental rugs, and unusual collectibles. Complimentary tea and sweets and wine and cheese. Gourmet breakfasts are unique and delicious, since Carol has taught cooking and written for a national cooking magazine. Bruce’s well tended garden herbs are used in the kitchen, and specially blended, freshly ground coffees add to your culinary experience. Care is taken to make your stay restful, pleasant, and memorable by paying particular attention to detail.You can rest assured that your stay will be one of comfort, relaxation and consideration for your privacy.